Scores of freshmen were at Chabad on thursday nght before classes to enjoy a pizza party. The next day,hundreds of freshmen joined by upperclassmen enjoyed the first Shabbat back at school with pre-Shabbat cocktail hour, spirited services, delicious Shabbat dinner followed by a dessert buffet and the opportunity to make new friends and reconnect with old ones. Chabad was packed to the rafters all Shabbat emptying out only after Havdallah. 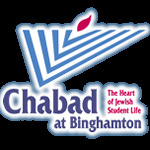 Over 400 students enjoyed Chabad's Welcome Back BBQ. Great food, cool music and the hottest people. The atmosphere? warm and inviting. Not one, but two intense days of blood donations marked what has become the biggest blood drive held at Binghamton University each year. The drive is held in memory of the victims of 9/11 and was co-sponsored this year with PhiDe Fraternity. A total of 128 donations were collected, and sent to the hospitals saving up to 326 patients (because of how we use the blood and the double-red cells). This beat BU’s record of 123 in 2009. What better way to begin a great year of Girls Nite Out program than with a fabulous opportunity to learn sushi rolling from an expert and meet scores of new friends. It was female bonding at it's best! After spiritual and spirited services,(and only after the Maariv service and Havdallah) hundreds of hungry students indulged in the time honored bagel and cream cheese post Yom Kippur feast co-sponsored with Hillel. What a fun and wonderful (not to mention delicious) tradition this has become! Apple picking with a great group of friends when NY State's apples are at their best, plus the chance to bake delicious apple pie, apple honey cake and apple kugel in the Chabad kitchen. Yummy! Did you want to see Greeks? Jews? Great food? Really cool people having fun? all the above and more was in abundant supply at the first Inter-Greek BBQ ever. This great event is a new annual tradition! Jazzuka rocked this year with music by the incredible David Ross ‘ and his band, fabulous food, great raffles and huge waves of the coolest people at BU. Small wonder that this is an all time favorite Chabad program! Mitzvas on the Spot for People on the Go! To the North, South, West and East... whereve one looked on campus during Sukkot one could find a Chabad staff member or volunteer with lulov and Etrog making it easy for hundreds of Jewish students at BU to bless over the four kinds every day of the Holiday. What can be more fun than mixing, kneading and shaping the very best bread in the world?- Challah! And the best part: participants not only made their Challah from scratch, but also got to enjoy their own Challah on Friday night, or take it home and eat it immediately! Everyone at the workshop had a great time. The sisters of AEPhi had a great time baking challah at Chabad Downtown. Measuring, mixing, kneading and shaping - and tasting of course! The challahs were delicious! Thanks to an anonymous NY based donor BU students have been able to have mezuzot affixed to their doors at no cost to them. Please contact Rabbi Levi at Chabad if you want your door to be next. A full house came out to hear Dr. S. Applebaum who delivered the fifteenth annual Pauline and Philip Piaker Memorial Lecture on the subject of Jewish Genes : What does Genetics tell us about our Identity? After his engaging presentation, a spirited question and answer session and elegant dessert buffet rounded out the evening. At Girls Nite Out honoring the month of Cheshvan 40 lucky participatns enjoyed making their own lip balm, concocting edible facials and getting funky manicures, plus a heathy dessert buffet and each other's company. Who would believe we have such talent here? Women's Cabaret show-cased art, photography, music and song in an unpilfting night of female bonding and self expression. The girls of Kaskeset performed and guest artist Ariella Goldberg from Toronto highlighted the event. Not for the fainted hearted but definately for the intrepid and fun loving. A group of BU Chabad students took the fields for paint balling. Tired limbs and no regrets is what was reported from the battle field. Classes at Chabad are stimulating, provocative, relevant and accessible. They are given to groups and individuals, all hours of day and night. The topic can be anything at all and the level is individually tailored from davanced to beginner. In other words, there is a class for everyone. For info about jLearn, Beit Midrash, Pizza and Parasha or any one of our many other class offerings please contact Rabbi Zalman. An elegant meal, a rousing talk by guest speaker, Rabbi Shlomo Yaffe, and the warm friendship of the jLearn community made the end of semester jLearn banquet a special event.